In this ever-changing regulatory environment, it is crucial to stay up to date on the latest compliance requirements. Is falling behind in the compliance world worth the price of noncompliance at your firm? Learn more about our consulting programs. Are you currently a registered rep or branch office considering going independent, looking to establish your own independent new firm, or acquire an existing firm? Find out more on how our services can help you reach your goals. 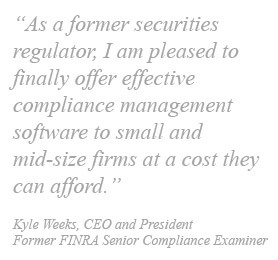 Securities Compliance Management will assume any of the duties traditionally performed by the Financial and Operations Principal (“FINOP”), from oversight of the financial books and records of the firm to filing the FOCUS Report.